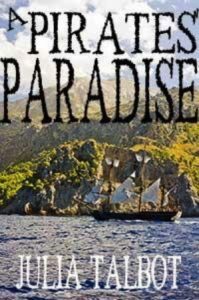 When Darien Keane is set off his pirate ship on a deserted island in the West Indes, he fully expects to die. Injured and wishing for the end, he falls asleep, only to wake and find he is no longer alone. Francois Le Blanc is surprised to find Darien on his shores, and even more surprised when he hears what Darien has to tell him. The year is 1793, nearly one hundred and fifty years after he lost his own ship to a mutiny. Together, Francois and Darien work to solve the mystery of where they are and how they could possibly be in the same part of the world and in different times. They work just as hard to avoid their attraction to each other, which seems doomed to fail from the start. Can they survive their need for one another, and their own pirate’s paradise?